How did I come to be on an island off mainland Scotland? Easy. After so much travel soil searching I needed to know what was happening in the UK. For the most part I had travelled in brittle rain deprived areas, from the bush in Zimbabwe, to the soil denuded desert in the NW Territory in Australia, to the green but not lush Oregon. In Patagonia I was buffeted by wind. Travelling from the tip of the South to central Patagonia, desertifying soil, for mile upon mile, got worse. 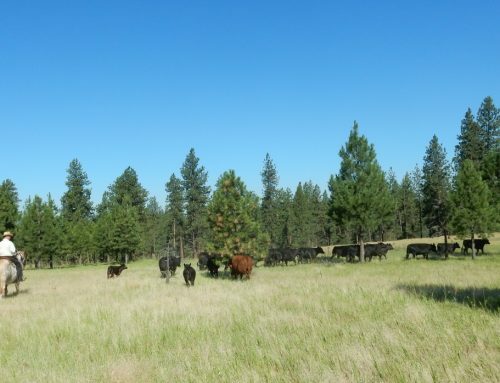 It was created by historical overgrazing but taken to extremes by a three year drought. 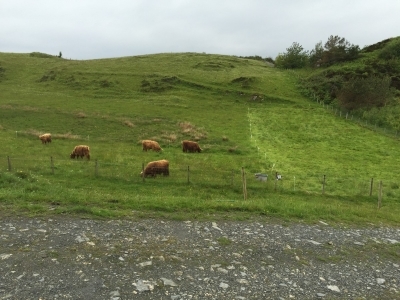 I saw how planned grazing could turn bare soil and oxidised grass into carbon and water holding soil and deep rooted plants, which were starting to cover it. But it was not magic. It needed commitment from visionary farmers and holistic thinking. But what happens in the UK where rain is plentiful, most of the time? Right now in the UK some concerned farmers, wanting to help themselves, the soil and the planet, are talking about 'mob grazing'. Even those of us not connected to the land have heard about it because of Graham Harvey who is the Agricultural Story Editor on our long running radio farming soap, The Archers. In addition, the runaway success of books about the land seem to tap into the deep yearning we have to connect to those who steward it on our behalf. The Shepherd's Life: A Tale of the Lake District by James Rebanks is one such book. Beautifully written, it is evocative of a way of life we tend to romanticise, which is in danger of disappearing if something is not done to regenerate the soil that underpins everything. Recent flooding in towns beneath the fells in the Lake District in northern England, have seen journalists such as George Monbiot write of their vision of sheep-free uplands, replaced by nut trees, because he blames eroded soil, and shallow rooted patchy grass that covers it, for the floods. A whole way of life, and land management, gone in one fell swoop. We may love the books of shepherding in the Lakes because we try to compensate for our own detachment. But at at the same time many of us, ignorant of the positive role of animals properly managed with planned grazing, hold a set of beliefs that animals on the land are destructive, and their meat at best a guilty pleasure, at worst an unhealthy habit. So I needed to see a positive application of Holistic Management in the UK. 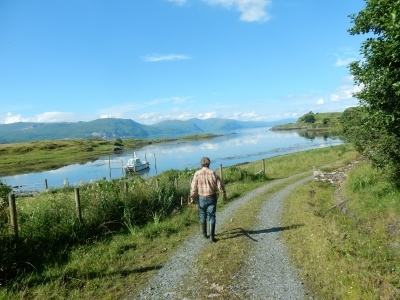 Roger and Gilly Dixon-Spain farm on the small island of Lismore, off the West coast of Scotland. Hopefully they would show me how broad the concept of holism really is when living on an island. Being accepted when going against the grain might take some doing. 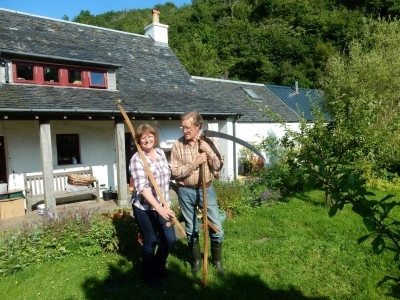 Roger and Gilly Dixon-Spain bought their croft fourteen years ago. 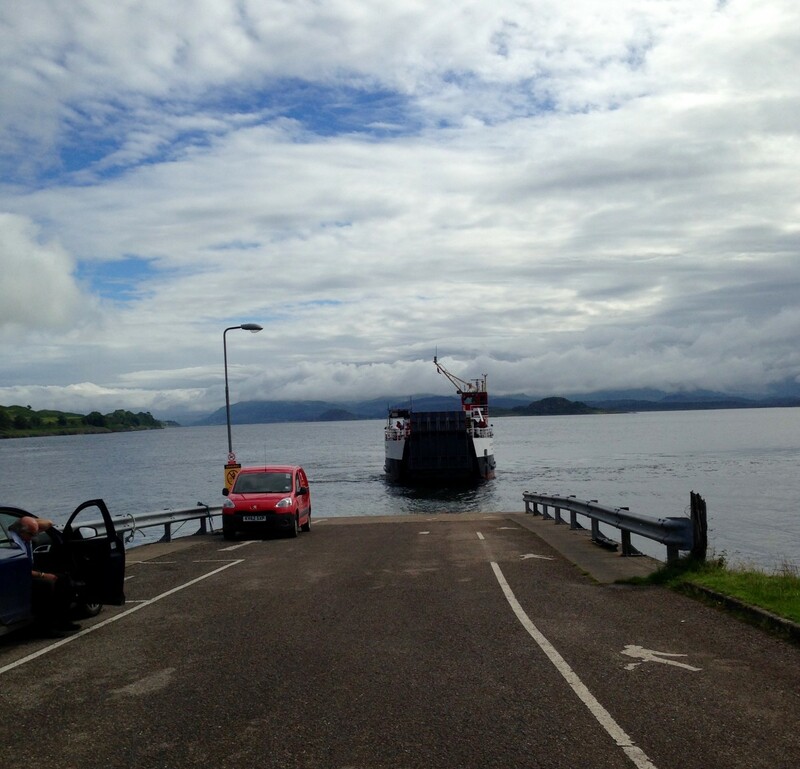 Lismore is a one hour ferry ride from the mainland town of Oban. It is 12 miles long, and one mile wide, with a population of 180. 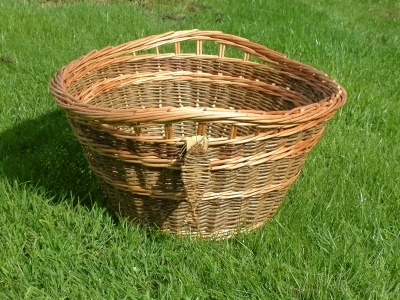 Until 1992 Roger was an industrial farmer in Cambridgeshire, on 1,500 acres, growing wheat, vegetables and soft fruit. He, like most of his contemporaries, depended on chemical fertilisers and sprays, whilst barely taking account of soil biology, least of all the effects that modern farming technology was having on soil health. Gilly, his partner and future wife, was a pioneering dentist who worked for the better overall health of her patients with complementary practitioners. One of them, a homeopath, helped Roger recover after she identified that exposure to agrochemicals was affecting his health. The farm and associated businesses were sold between 1990-94. 'I sold them then because of my perception that my grandfather and father had both farmed out of some unspoken obligation, and I was beginning to feel that way too. My grandfather was a penniless vicars son, who found that he was obliged to give up his chosen career as an architect to farm, if he wanted to marry the love of his life, a wealthy farmer's daughter. I imagine he went willingly, as anyone would perhaps have done, from penniless to having a virtually assured future. 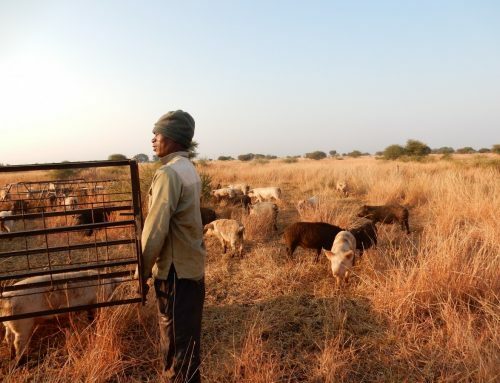 He turned out to be a very capable farmer and businessman, and ended his life farming 3000 acres. Likewise it seemed that my father felt some obligation to farm following his elder brother’s death in WW2. I don't know if he wanted to farm. He was however a good farmer,but not very good at managing money. So the farms were sold because I saw the same thing happening to me. I got into farming because I was expected to. Then my Father died suddenly in 1976 aged 55, having already sold half the farm to pay off personal debts. The business was virtually bankrupt, so I spent the next twenty years putting it back on it’s feet and made a financial success of it. Once the job was done, I was free to choose to go to art school, something I had wanted to do as a 17 year old. I trained in furniture making for two years in the late nineties. 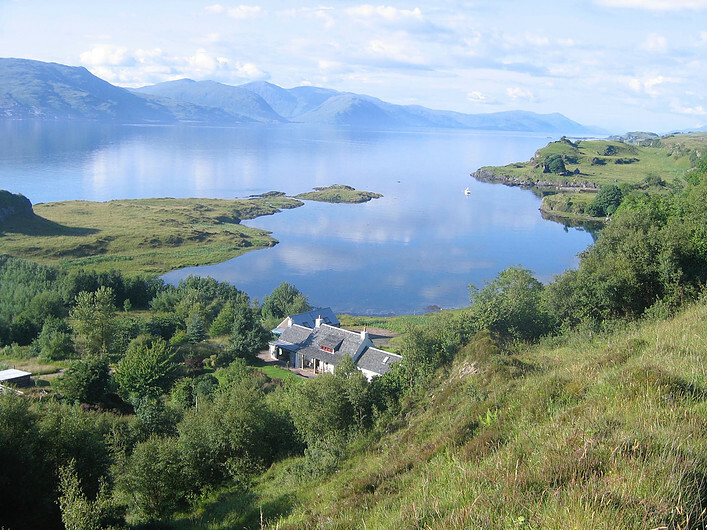 A sailing holiday that was meant to take us to France, by chance took us to Scotland instead, in August 2001. We were so taken by the beauty of the west coast that we were living in Scotland by mid January 2002. We just wanted a different life that would have nothing to do with farming or living on an island. I imagined designing and making furniture for the rest of my life. Gilly was not sure what she wanted to do, but dentistry was not an opiton. That all changed when we bought the croft in June of the same year. It took two years before it was ready to move into. 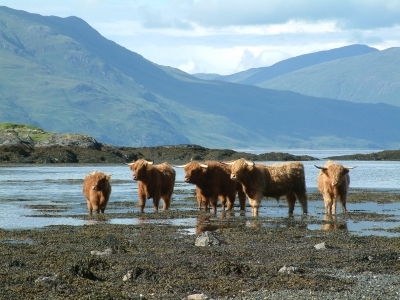 At that point too we were able to buy our first Highland cattle.' But it was not until 2009 that what Roger describes as the 'tipping point' happened after watching a BBC documentary about Rebecca Hosking called 'A Farm for the Future.' It was the story of her journey from wildlife photographer to understanding that nature holds the key to farming in a low energy future. From that point the penny dropped about the importance of not disturbing soil, keeping it covered, and mimicking what happens in the natural world. The interest in 100% grass fed cattle, and the practice of no dig gardening, permaculture, forest gardening, human nutrition and health followed, all predicated by the health of soils In July 2016 Rebecca was interviewed by the BBC Country File because with her farming partner she now farms holistically with planned grazing, with a flock of a 1000 sheep and lambs. Reading Graham Harvey's book 'We Want Real Food' was also important. With farming for profit at the expense of the soil no longer on the agenda, Roger and Gilly were not short of role models, and were further inspired by Joel Salatin, Gabe Brown, Allan Savory, Carbon Cowboys and others. They started to adopt the same systems of management, mob grazing with their animals bunched and moving behind electric fences, to mimic nature. 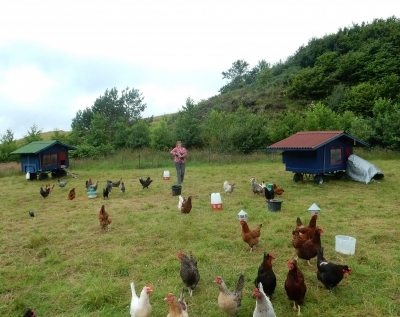 Because in nature herbivores are always followed by birds, the cattle are now followed by Gilly's 40 chickens, where possible, in mobile hen houses, designed and built by Roger. As a result their pastures are showing signs of change, and improvement, and are very different from what they had inherited in 2002. Before they arrived the grass was very short with many rushes, easily punctured by hooves, which meant that poaching (making a muddy mess) was a problem. In sharp contrast, pastures now have a substantial mat of living, dead and decomposing plant material as well as developed root systems to resist the weight of heavy animals. 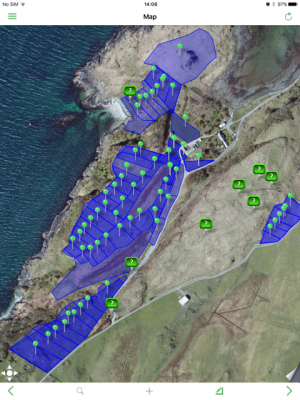 The only challenge is providing water to each of the small virtual paddocks (see map below). They have successfully experimented with distributing water to 16 acres of the croft using a water ram pump. The major job of installing piped water for the cattle is next on the list of things to do. Despite these positive changes the Dixon-Spains still felt that they were learning 'on the hoof', and grabbed the chance to find out more about Holistic Management by attending the Savory Institute conference in San Franciso in October 2015, which is where I met them. In May 2016 Roger enrolled onto the Savory Institute course to become an accredited professional educator and practitioner. Part of this was to complete an 8 day Holistic Management training Boot Camp at the Savory Network Hub in Penrith in May 2016. On the croft the cattle and sheep are entirely grass fed, because as herbivores that is what they are designed to eat. 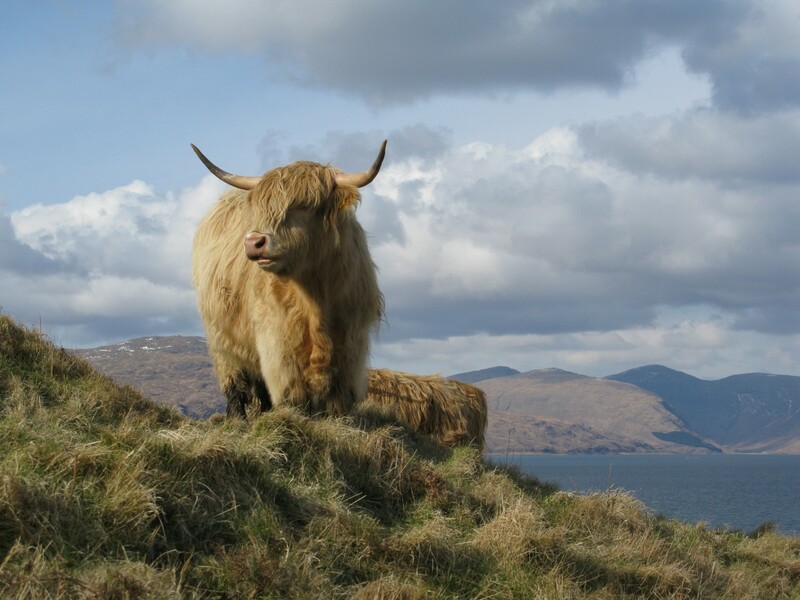 Their health and wellbeing depend on healthy nutrient dense forage, and that can only come from healthy soil which is the whole point of managing the grass and land on the croft differently. 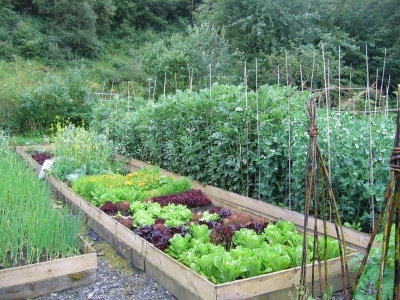 No fertilisers, pesticides, herbicides or pharmaceuticals. Just grass, grown in pastures that have improving water and nutrient cycles, energy flow, and soil biology. All this for (and from) animals that are evolved to live outside all year round. Ploughing a new furrow, to coin a misleading phrase in a bastion of no till, may lead to curiosity from neighbours. But the Dixon-Spains are not looking to persuade others who may be resistant. They are looking for people like themselves who are open to change. They feel that more will be gained in the long run by showing rather than telling. Roger and Gilly feel this quote from Buckminster Fuller says it all: 'In order to change an existing paradigm, you do not struggle to try and change the problematic model, you create a new model and make the old one obsolete. That, in essence, is the higher service to which we are being called.' So they see themselves as early adopters, unperturbed if others see them as strange for deviating from the norm, and seeking to influence others solely by their firmly held beliefs and example. The meat produced from the cattle they slaughter each autumn when the grass stops growing, is hung for at least 28 days, butchered and packed professionally, and sold direct to the public within Scotland. They are market makers and as such will only increase production that is in step with the demand they are gradually creating for nutrient dense 100% grass fed meat. It was clear during my visit that land management on the croft is in alignment with the Dixon-Spain's values, and their passion for sustainability, community and the environment. With 180 people on the island, and an ageing population, they are acutely aware that they need to contribute to it, and help it to thrive. Having to get on is paramount when choices for multiple networks simply are not there. In their view making time for the community facilitates greater understanding of differences, and common ground.They devote time and effort to promoting those things that they believe are environmentally, economically and socially sound, in their community and beyond. Island life recognises our interdependence, in ways that those of us caught up in the isolation of normal life may never get to experience. 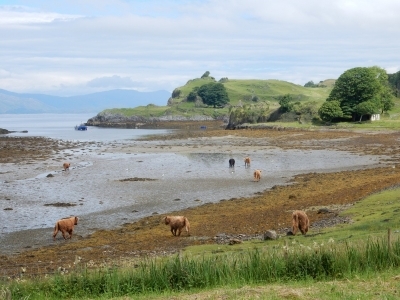 In three days Gilly did her turn as Granny Bus driver, completed some painting in the Island Hall ready for a funeral, which would apparently be attended by the whole island, and filled in for Roger’s turn as a driver, when he had to mend a fence broken down by a Highland steer using his horns to good effect. All that in addition to hosting me for three days! And managing the vegetables and the chickens too. Roger was in the process of completing some bespoke stairs for a neighbour who had been badly let down by a builder. It was something he had never attempted before. I saw the results and they were stunning. After his training in May, Roger returned home with a vision of running a demonstration unit on the croft. His story of transformation from one type of farmer (destructive of the land) to another (soil builder, ditching the plough, and managing animals, grassland and arable differently) will form the core of what he has to give in the future. 'At 71, I’ve come to the realisation that your life’s work can start at any age. I look back on my years as an industrial farmer and finally see meaning and purpose. It has given me the perspective I now have, and informs everything I think and do and feel about farming and the environment. I lived through that period so I could be ready for this. I plan to spend the next 30 years of my life as an ambassador of regenerative agriculture, supporting as many people as I can to make the transition to a sustainable system for food production with it’s foundations built on healthy fertile soil.' 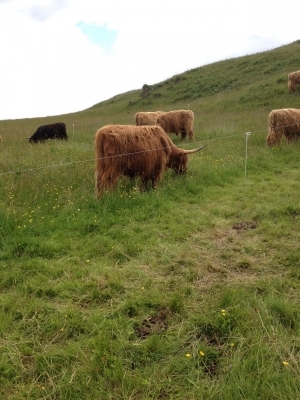 MOB GRAZING VERSUS HOLISTIC MANAGEMENT If we are becoming familiar with the term mob grazing, UK farmers are not yet sufficiently exposed to the broader concept of Holistic Management. This focuses not just on the soil, but also the life that surrounds it, and the decisions we take to manage our individual contexts sustainably and fairly. Allan Savory, the visionary who developed it after years of observation of land and soil management, including failures of mob grazing in some instances, came to see that wider contexts cannot be ignored in decision making, nor the huge paradigm shifts that occur as a result of this kind of thinking. 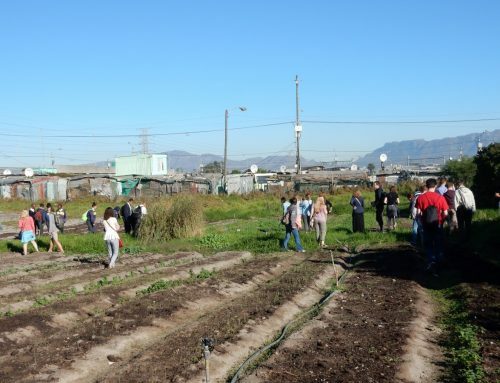 Gilly and Roger are ongoing students of this holistic way of managing the land, and committed members of a growing community who share this holistic perspective. Their mission is to inspire others to follow what they are doing with the land because the results speak for themselves. The fact that it contradicts what has been done over successive generations may be an obstacle for now, but they are looking to the future, and happy to carry on making a difference. So the take-away message is that if the context (relationships, farmer succession, wildlife, weather, land, community ...) has not been taken into account we could end up throwing the baby out with the bathwater. Right now vegetarianism and it's strong arable bias is wrongly, in my view, seen as part of the solution to climate change. But the damage that that type of farming does means that it is not a bloodless revolution, because whole ecosystems have to die in the process. The methane emissions of feedlot cattle, and to a lesser extent grassfed cattle, are not only far outweighed by the carbon sequestered from the atmosphere into soil which is covered, and enriched by animals managed with planned grazing, but are also absorbed by methanotropes, when animals are grazed on pasture holistically. So let’s not beat about the grass here. Underneath it all, there is a crisis in the UK with degraded soils from overgrazing, use of heavy farm machinery causing compacted ground, and the use of fertilisers and herbicides. Roger and Gilly are testament to holistic thinking, in their approach to farming, to their relationship, and to the community they are part of. Their journey is still ongoing, but in contrast to their former life spreading chemicals on the land, to no long term advantage, they are happy to have been given the opportunity to give back. 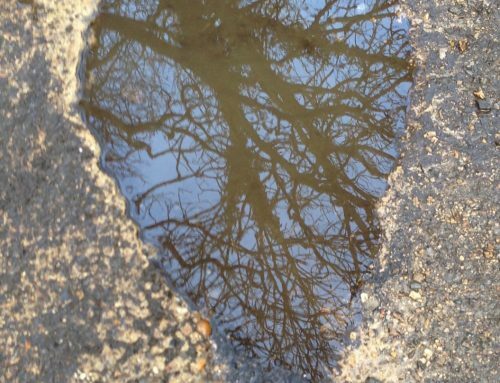 Not just to the soil but also to the future of our children and the planet. Their joint vision feeds the future, and their souls.